Rosemary or thyme infused cocktail with cava and gin. For the simple syrup: In a small saucepan, bring water, sugar, rosemary or thyme and orange peel to a boil. Reduce heat, simmer for 10 minutes. Strain and chill for 1 hour. For the cocktail: In a glass, combine 3 tablespoons simple syrup, cava, gin and cherry juice. 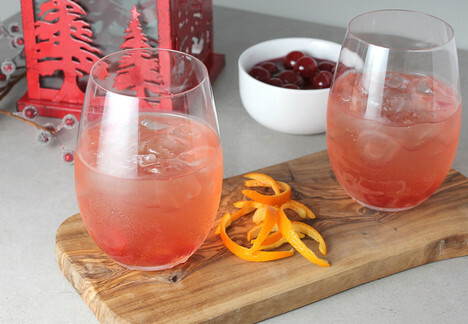 Stir and garnish with crushed cherries and orange twist. Tip: Use remaining infused simple syrup in other cocktails or iced tea.